I didn’t plant a garden this year, but a friend did, and she has been sharing the bounty! I have garden fresh tomatoes for the first time in years, an I am in hog-heaven! I put this quick snack together a few hours ago. 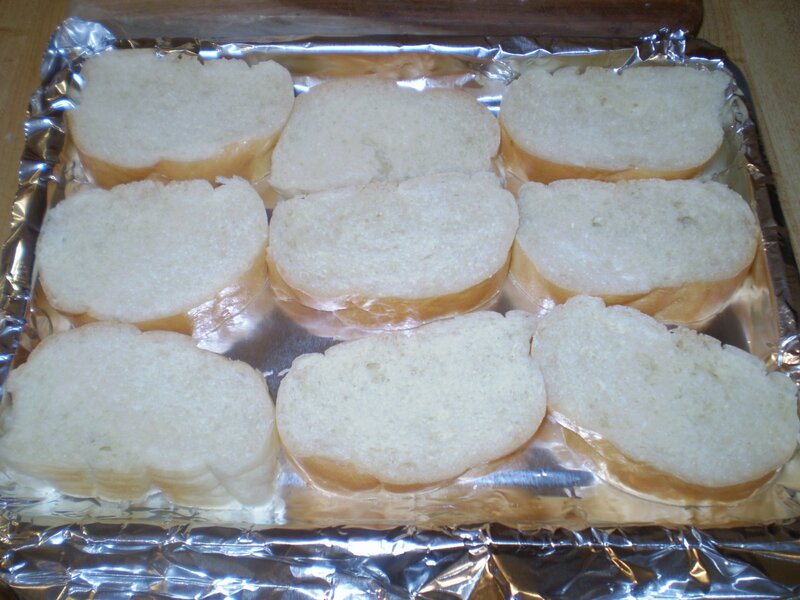 Put the bread slices on a foil lined toaster oven tray. Spray with olive oil and sprinkle with garlic granules. Turn slices over and repeat on the other side. Sprinkle with oregano and basil. Optional: Toast the bread at 300°–325° to your preferred crunchiness. Skip this if you’re in a hurry or if you want your bread soft. Top each slice of toast/bread with a slice of tomato. Sprinkle with more basil and oregano. Slide the toast in the oven at about 350° until tomato is warmed through. Serve with a small bowl of balsamic vinegar. Dip toast in the vinegar before each bite. Croutons add a nice crunch to many salads, but I just can’t bring myself to buy a box of croutons at the store. I mean, it’s just toasted bread! When I first investigated making my own, the recipes told me to cut my bread into cubes and fry it in a skillet of oil. Too much trouble, and too much oil! Over the past few years I’ve come up with my own technique that works for me—and for anyone else who’s enjoyed one of my salads. 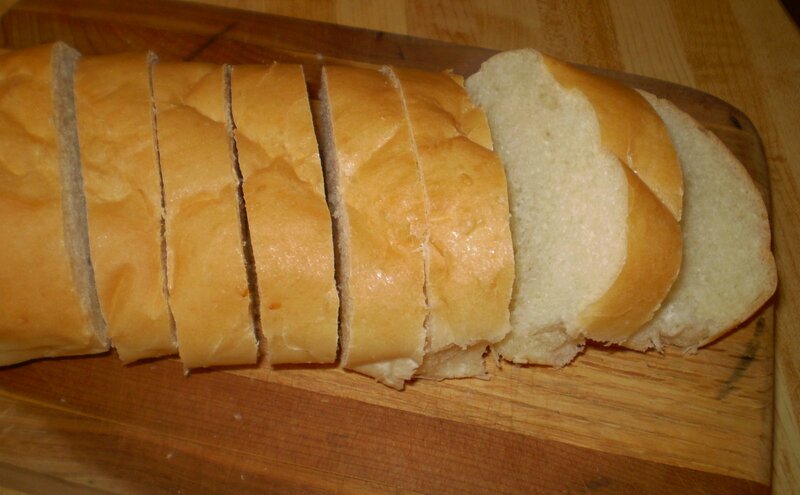 I start with French bread, the soft American kind from a grocery store works. Cut what you need into slices about 3/4 inch thick. Arrange on a foil lined baking sheet. I use my toaster oven. Coat with extra virgin olive oil—I use a spritzer bottle—and sprinkle with your favorite herbs. The seasoning could be as simple as plain garlic powder. I use my own mix of Janz Seasoning Blend. Oil and season both sides of the bread before putting them in the oven. Cooking temperatures vary for toaster ovens because the food is so close to the heat source, but for my current toaster oven, I usually turn the heat to just above 300° for croutons. A lower heat will yield dryer toast, but it takes longer. When I can smell the croutons I’ll check on them. When the top is hard to touch and starting to turn gold I’ll turn them over so both sides will toast evenly. Leave them as long as it takes for the bread to dry all the way through. Break a piece to determine dryness. If it snaps apart, it’s dry, but if it’s still soft and tears instead of breaks, then it’s not a crouton yet. If the bread browns faster than it dries through, turn the heat down and leave it in a very low oven, as low as 200° if you have time. Eventually turn the oven off and leave the toast there to cool off slowly. When the toast is totally cool—probably the next day—store it in a plastic bag. If you bag it before it’s cooled to room temperature, the heat will continue to dissipate and the inside of the bag will sweat which softens up the toast you just spent all that time drying out. So don’t be impatient to bag this up. When I’m making a salad I’ll take a couple of pieces of this seasoned, dried French toast and break it into bite-size pieces over the top of my salad. If I break it into crouton-sized pieces when I bag it, I found the pieces get smaller and smaller and there are lots of crumbs. Which leads to another use for this seasoned bread. Bread crumbs. This technique creates some very tasty bread crumbs when you need them. Depending on what you’re using them for, you can break them into small chunky pieces, pound them into crumbs, or put them in a food processor to make some really fine bread crumbs. Store any leftovers in the freezer for future use. 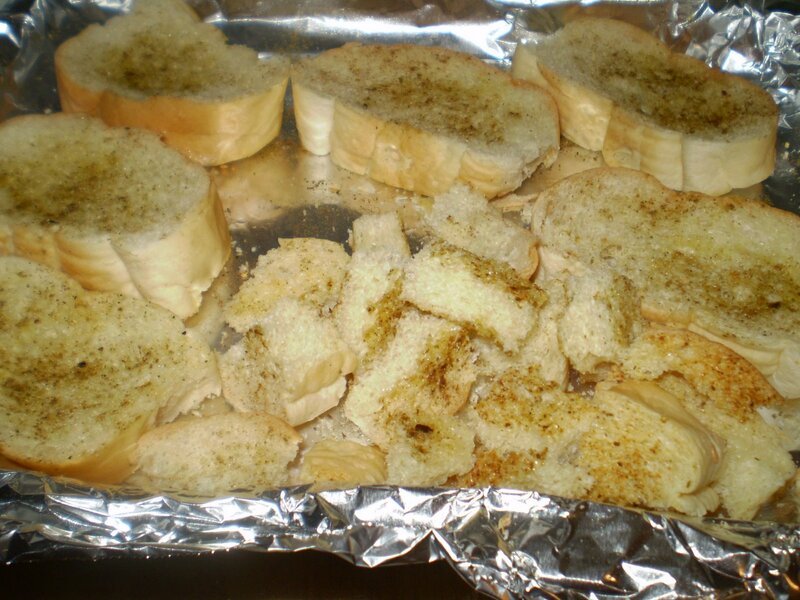 I used these bread crumbs, along with my traditional cornbread in my turkey dressing last year, and it was a big hit! My mom even wanted the recipe—and she’s the one who taught me how to make dressing! 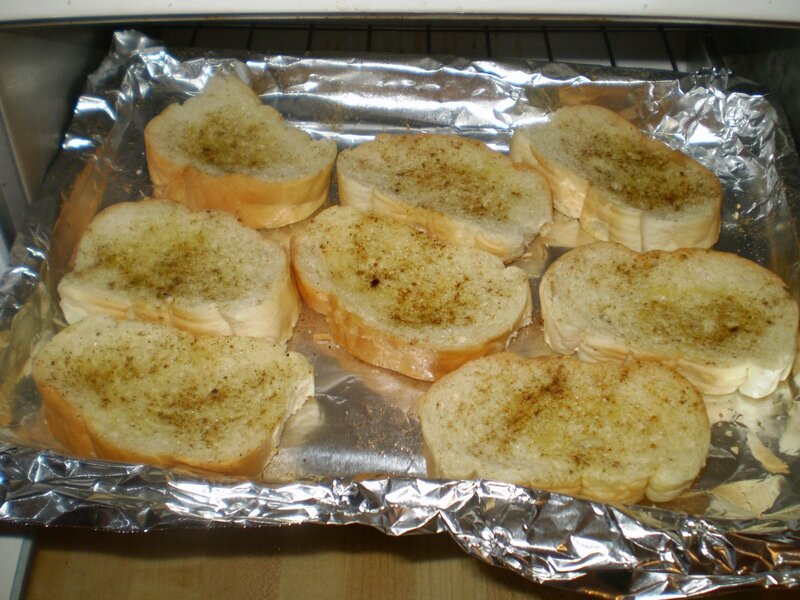 Once you turn the toast over, you can top it with a variety of ingredients for a snack or appetizer. It makes a really tasty cheese bread, just top with your favorite cheese and turn the oven to broil until the cheese melts. This is also how I made the bruschetta I mentioned a few days ago. It’s also tasty to break it into somewhat larger chunks and dip into a marinara sauce for a different kind of snack. I haven’t priced store-bought croutons recently, but I get a lot more bang for my buck buying a loaf of French bread and making my own crouton toast than I would ever get out of a box. I went to the farmer’s market yesterday morning and found some really nice tomatoes. They were from Texas, but that was as close as I could get to “home grown” this early in the season. I was in the mood for a late night snack last night and the tomatoes sounded good so I decided to make bruschetta to take advantage of the fresh flavor. Generically speaking, bruschetta is simply toasted bread, seasoned with olive oil and herbs, topped with tomato and cheese. It can be prepared on the grill or in the oven. Here’s how I made this batch in a toaster oven. 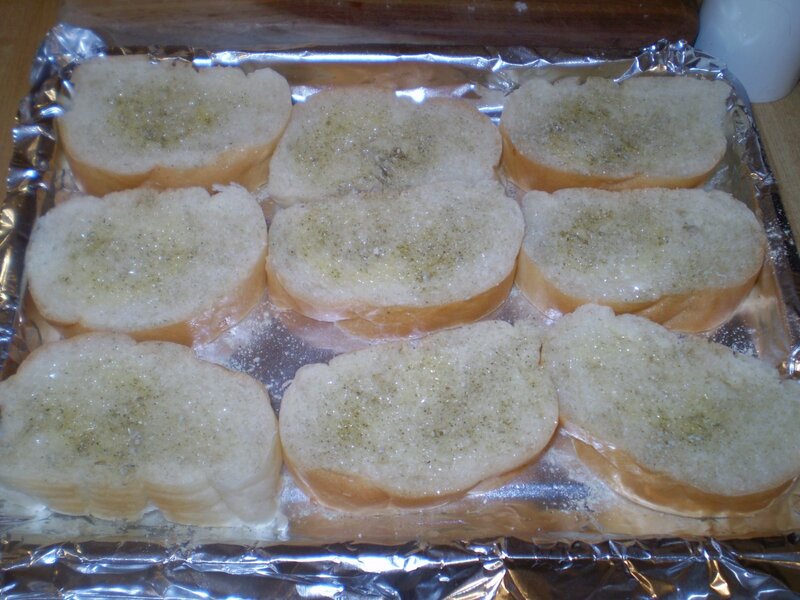 Slice French bread about 3/4 inch thick, and place on foil-lined toaster oven baking sheet. Coat both sides with extra virgin olive oil and sprinkle with herb seasoning. When both sides are golden place slices of tomato on top of each slice of toast and sprinkle with more herbs. Top with grated hard cheese and return to the oven until cheese is melted. Remove from toaster oven and top with slices of avocado. Pour a thin layer of balsamic vinegar on serving plate and place bruschetta on the plate in the vinegar. To coat with extra virgin olive oil* pour the oil in a small condiment bowl and use a pastry brush to paint with oil. 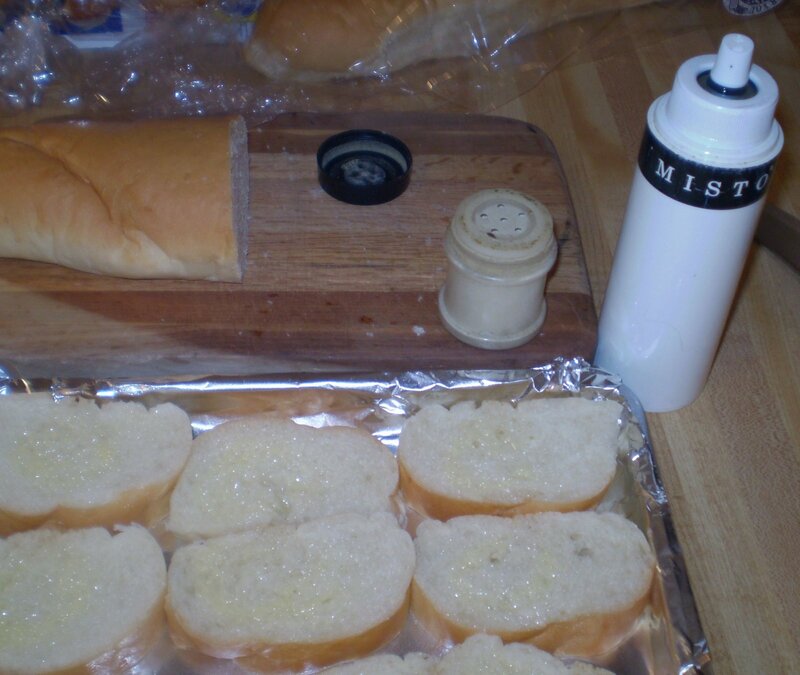 An easier way is to keep oil in a spritzer bottle and spray it on the bread slices. The spritz method also lets you use less oil if you’re concerned about counting fat grams. Basil is the herb* most frequently found in bruschetta recipes. Top tomato slices with fresh basil leaves or sprinkle with dried basil if you don’t have a favorite herb blend you want to use. I’ve created my own herb mix, Janz Seasoning Blend, that I use on practically everything. Basil is one of the prominent flavors in this blend. Some bruschetta recipes call for chopped tomatoes*. However I prefer slices so I don’t lose any when I eat it. It much neater to eat if you don’t have to worry about the tomatoes falling off when you take a bite. I have a cheese grater that I fill with chunks of Parmesan, Asiago and Romano* cheeses. When I fill the grater with different cheeses I automatically get a cheese blend when I use it. Another cheese option is to slice thin slivers of Feta on top of tomatoes. By the way, cheese is the reason I line the baking sheet with foil. Small bits of baked cheese can be hard to clean. A foil liner can be tossed. Rinse the baking sheet and you’re done. In the past, I have “drizzled” balsamic vinegar* on the top of each piece prior to serving, but found it hard to “drizzle” and frequently ended up pouring vinegar over each piece. This obviously makes the toast soggy and the flavor can be overwhelming. Plan B has been to pour a bit of balsamic vinegar in a condiment bowl and serve it on the side for dipping. Last night it occurred to me to pour the vinegar on the serving plate before I pulled the toast from the oven. I placed the toast on the thin puddle on the plate and the bottom 1/8th inch of the toast soaked up the vinegar, just enough to provide flavor in every bite without making the toast soggy. Unfortunately, I didn’t think to take pictures before I ate this tasty snack. However, I still have a couple of fresh tomatoes and as soon as an avocado is ready, maybe tomorrow, I’ll make it again and I’ll add some pictures. As I wrote this I looked up recipes for bruschetta and found some alternatives with white beans or prosciutto. I’ll give those variations a try and share the results sometime soon.